Profigold High Performance Digital Audio Coax 2m - Digital Coaxial Cables, Profigold HDMI Toslink Optical RCA Phono Cables, RCA Phono Cables & Leads - Audio Cable & Lead, Audio Cables Headphone Extension RCA Cable 3.5mm Jack Subwoofer, Audio cables jack cable Leads Cables Phono RCA 3.5mm jack aux headphone. Double screened OFC copper conductors for ultra pure digital signal transfers. 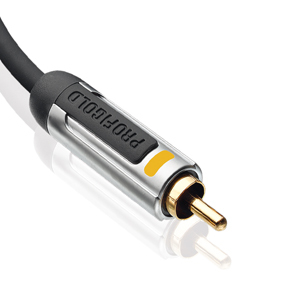 Currently viewing: Profigold High Performance Digital Audio Coax 2m - Digital Coaxial Cables, Profigold HDMI Toslink Optical RCA Phono Cables, RCA Phono Cables & Leads - Audio Cable & Lead, Audio Cables Headphone Extension RCA Cable 3.5mm Jack Subwoofer, Audio cables jack cable Leads Cables Phono RCA 3.5mm jack aux headphone.